How to save with IGA Catalogue is one of the easiest things in Australia. Regular IGA Catalogues are great guides to find the half prices of fresh fruits, snacks, grocery, pantry, bakery, deli and other categories of products from the IGA supermarket. Sirena Tuna, Birds Eye, Pepsi are all half-price deals. Potatoes, onions, cucumber, rockmelon, and more fresh products are in the fresh range of IGA. Buy brie cheese, cheese platters, fetta, mud cake, and more bakery dept. Enjoy the ice cream, frozen foods, and more quick foods or Autumn deals from supermarkets like IGA in these days. A 3 Day sale is also one of the highlights from this catalog. 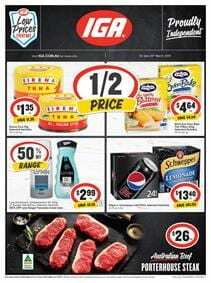 Don't forget to see the IGA half-price sales of 3-day sale. We can also see some half prices in the categories like snacks and beverage. Cadbury Medium bars, Arnott's TimTam, Coke will cost cheaper this week. Non-food parts of the IGA Catalogue can also be interesting to you. Save on batteries, Palmolive products, pet food. Stock up some snacks for whenever you need during your favourite show. IGA offers half prices of Pringles, Snickers, Mars, and more.